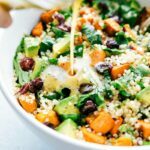 Fresh and healthy roasted sweet potato quinoa salad made with spinach and avocados. A healthy and delicious lemon vinaigrette dressing coats this salad. 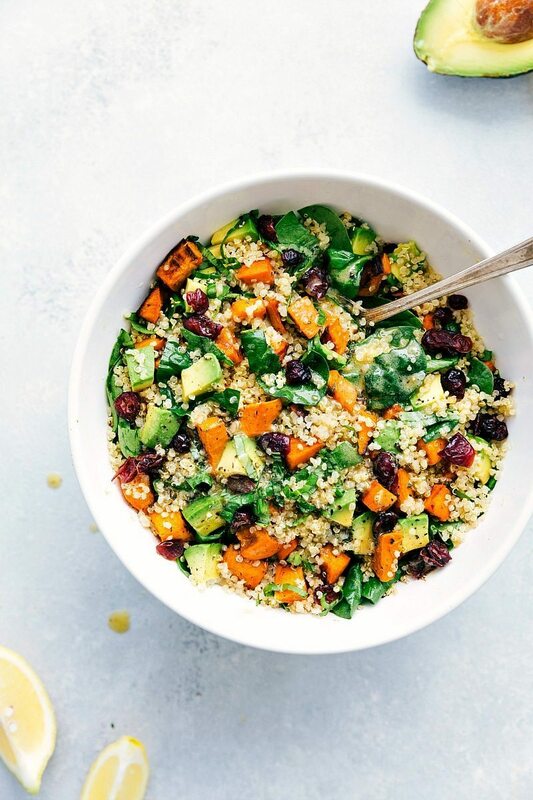 We’re seriously OBSESSED with this sweet potato quinoa salad — perfect textures, delicious flavors, and it’s so simple to make! Not to mention how healthy this quinoa salad is! It’s packed with good for you ingredients that will keep you fuller for longer. And the dressing? 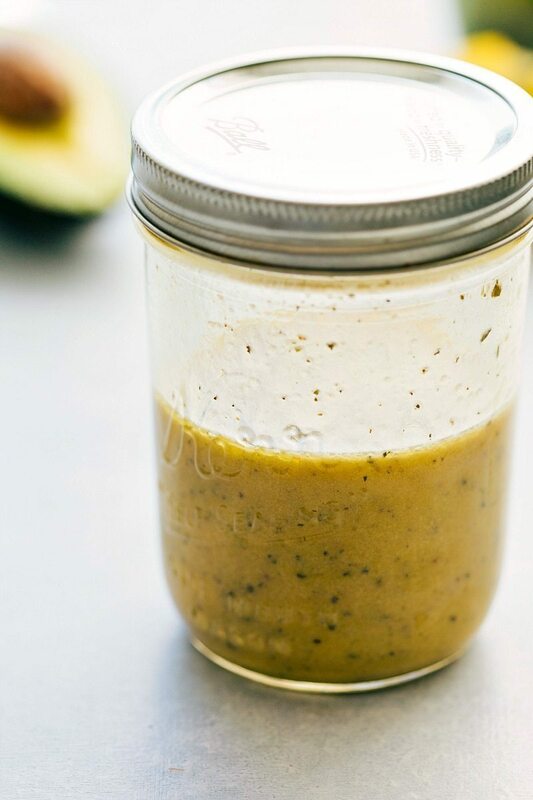 You will go crazy over this lemon vinaigrette! It’s light, fresh, healthy, and tangy. There’s dijon mustard, lemon juice, dried herbs, vinegar, and olive oil. All great ingredients and together, they pack a punch! I seriously make this dressing just about weekly and it’s gone within 3-4 days! Only add dressing to what you plan on eating in the same day. 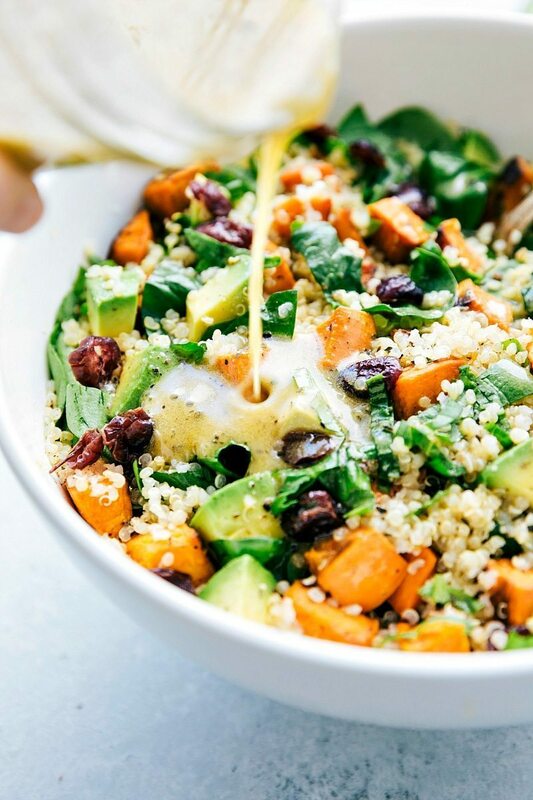 Unfortunately, this sweet potato quinoa salad doesn’t sit super well with the dressing. If you are planning to have leftovers, toss only what you’ll being eating on day 1 with the dressing. Other than that, this salad can store in the fridge pretty well for up to 3 days. That is, with the exception of the avocado. Unfortunately the avocado browns and takes on an odd texture. So, if you plan to have to over the course of a few days, only add avocado to what you’ll be eating day 1. I’ll typically add half the avocado one day and then place the other half in a plastic bag (squeeze some lemon or olive oil on the exposed side) in the fridge until I’m ready to add that to the quinoa salad. Roast the sweet potatoes: oven roasting the sweet potatoes is what gives them the absolute best flavor and texture. To avoid “soggy” potatoes you don’t actually use that much oil and make sure to flip them about halfway through their baking time. A high heat oven and a bit of olive oil + salt + pepper and you’ll be amazed how flavorful those bites of sweet potato are! Add your favorites! I kept this salad pretty simple, but feel free to add some of your favorite salad toppings — think roasted pumpkin seeds, sunflower seeds, sliced almonds, pistachios, fresh parsley, feta cheese, goat cheese, etc. I love the flavor of goat cheese with this salad! This salad is meat-free, but it’s still got plenty of protein. You’ll be amazed just how filling it is. Sometimes we’ll grill some chicken to serve on the side of this salad or chop up chicken and throw it in the salad so that’s definitely an option, but it is plenty filling and protein-packed on its own! Rinse the quinoa. Quinoa has a bitter saponin coating so you’ll want to quickly rinse it before making the salad. I just pour the quinoa in a fine mesh sieve and rinse it really quickly. Also, I typically cook quinoa in chicken or vegetable broth (infuses it with more flavor), but just use water for this quinoa salad because the lemon dressing is very distinct. 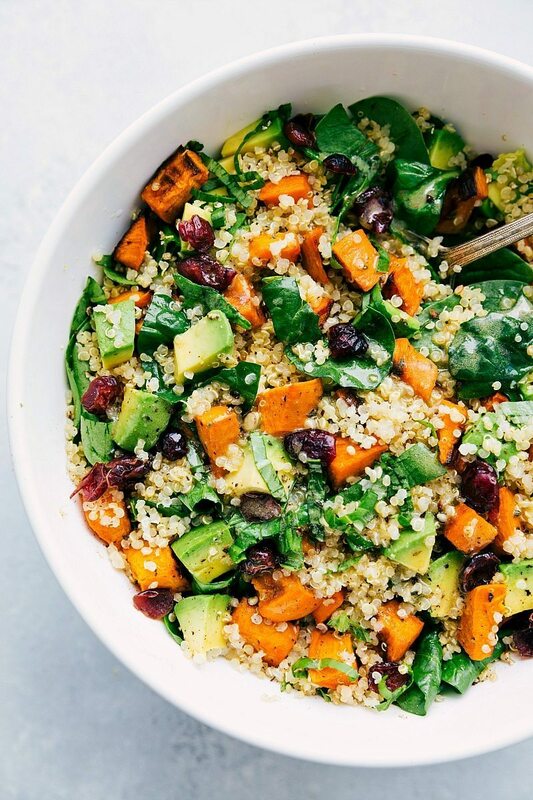 Fresh and healthy roasted sweet potato quinoa salad made with spinach and avocados. A healthy and delicious lemon vinaigrette dressing covers this salad. Preheat the oven to 425 degrees F. Peel and coarsely (but evenly) chop your sweet potatoes. Place on a large sheet pan. Drizzle with olive oil and salt + pepper (to taste). Toss everything to coat and place in the preheated oven. Let roast for 15 minutes and then flip the potatoes and roast for an additional 10-20 minutes or until desired tenderness. Toss the salad with desired amount of dressing (you might have some leftover depending on how dressed you liked your salads!) Enjoy immediately. Do not dress anything you don't intend to eat that day. This salad is best eaten immediately after being dressed, so if you want leftovers, only toss what you will eat with the dressing. Chelsea, this salad looks amazing! I love the combination of the flavors and it is so pretty. So perfect for the season! This looks so good — we love sweet potatoes, and I’m always trying to find new ways to prepare them. Yummy! Thank you Anne, and thanks for the pin! This is a beautiful looking salad! So many great flavors going on in this, I totally need to try it! I made a vow to start eating better too (apparently I also like to eat a wee-bit too many cookies, haha), and this is a perfect healthy recipe! Holy moly was this delicious! Even my husband loved it! Definitely adding to my roster of Meatless Monday meals! Well done. I love hearing that! Thank you so much for your kind comment! Can you eat this cold or does it need to be heated? Looking for more plant based options for lunch and have no way to reheat. I always eat it cold 🙂 Enjoy! This salad looks amazing! I’ll be trying it this weekend. Great tips about preparing the individual ingredients. I threw in some elderly broccoli and 3 unpeeled garlic cloves to the roasting. I used the smashed garlic cloves in the dressing (it IS phenomenal) and didn’t put craisins in the dish as I didn’t feel it was needed. I also used a combo or baby spinach and baby kale chopped fine. Finally, I added canned, cooked lentils (rinsed to remove the sodium) to increase the protein. DELISH! My husband and I LOVE this salad. I’ve made it numerous times, and everyone always ends up calling and asking for the recipe. One question, about how long do you think I can keep the dressing? I’d love to keep a big mason jar full for a month or so, but wasn’t sure because of the lemon! I’m so happy to hear that! Yay! 🙂 Thanks so much for the comment Angelina! As far as the dressing, I think the garlic is more of a concern than the lemon (lemon is a natural preservative!) so you could use garlic powder instead of minced garlic to make it keep longer. I don’t know for sure, but I would think this dressing could last 2 (maybe 3) weeks in a tightly sealed jar in the fridge. what a creative salad recipe, I love sweet potatoes so was drawn by the title, and really like all of these other ingredients, too, the dressing is very inspired, very impressive all in all, thank you for this wonderful salad< I'm having mine topped with pistachios! I had my older son over for dinner who is vegan. This was so tasty and he loved it. I also baked some chicken breast and my husband and I ate this salad with it and all the flavors were so good. Excellent recipe! The flavors are amazing! 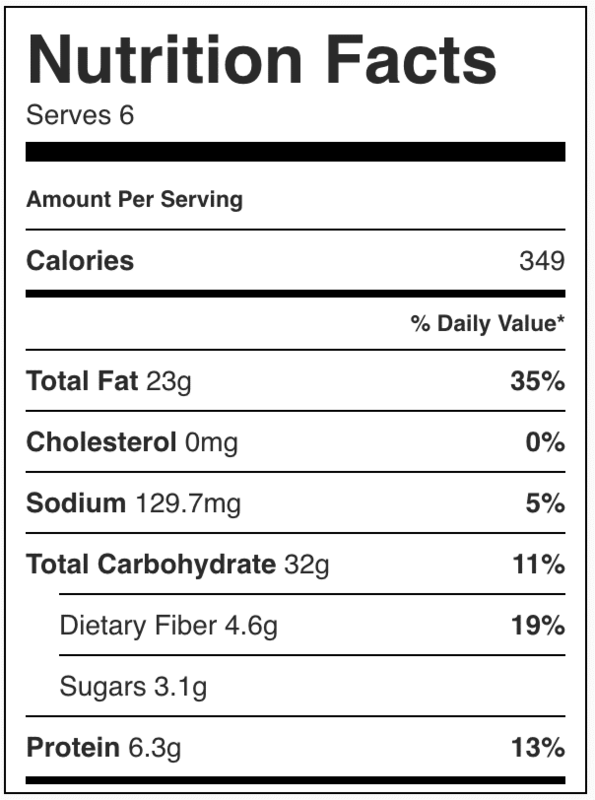 What would you recommend as a substitution for the sweet potatoes? I love them but they’re on my “avoid” list of foods to eat. Thanks! Could you do butternut squash? Very adaptable recipe. Used kale instead of spinach. Roasted acorn squash, sweet potatoes, and then with 15 minutes left, added sweet onions and asparagus. In the dressing, I used fresh basil and mint leaves, an inch of ginger, avocado oil instead of EVOO, freshly ground pepper, and a heavy dash of sesame seed oil. Put it in a blender to smooth out the hard ingredients. It was a potluck hit, and my wife came home and had another big bowl. I love this so much! I did sub baby arugula for the spinach, but otherwise made per the recipe. I used goat cheese and sliced almonds- it’s such a beautiful and tasty salad. Definitely going into frequent rotation. Thanks so much! Really good recipe but it definately needed a crunch factor…added some chopped celery. Made it perfect. I know this is an old post but just wanted to share how much I love this recipe. I’ve been making it all summer and sharing it with all my vegan friends. So happy to hear that! 🙂 Thank you!! Sounds incredible! I want to premake this salad the day before for a picnic, and it needs to go into individual serving containers, so I can’t dress it last minute! Which ingredients might I take out to make the dressed salad more stable? Thanks! I’d make it without spinach and avocado! Just a note that as pictured these are yams, sweet potatoes are white. Please clarify in your recipe. It is disappointing to buy sweet potatoes only to find out that the recipe shows Yams. You prep/total time on this are WAY off. You’re totally right; definitely an error. It’s been updated, thank you!! I love this salad a lot! Amazing flavours and it’s my go to for friends lunches! I’m obsessed with the dressing and am actually using it on my green salads too. Perfect excuse to use my stash of herbed mustard jars! Thank you so much for sharing! Is the cup of quinoa cooked or a cup prior to cooking it? Uncooked! Sorry it was unclear, I just fixed it. Thanks! Is the cup of quinoa cooked or uncooked? Absolutely love this salad! Sweet potatoes are one of my favorite foods. Added some coarsely chopped pecans for crunch. So delicious! Wow. This was so good and hearty. I was skeptical at first. Thought the dressing was ok but not stellar. But then I tossed everything together and WOW!! This was amazing! I subbed dried blueberries for the cranberries and added almond slivers. Also used romaine Bc I didn’t have spinach. I will definitely be making this again!! Don’t skip roasting the sweet potatoes or the avocados – this is what makes it so delicious. Also I am dairy free so I skipped the feta but didn’t feel like I was missing anything. Thank you for the recipe!!! Loved this dish! Hate to call it a salad because it’s so luxurious! The roasted sweet potatoes, avocados, and dressing were amazing together. I subbed pearled barley for the quinoa because that’s what I had on hand, just had to cook it a bit longer. I also added golden raisins and chopped pecans- amazing. The best accidentally vegan dish I’ve ever made! Looks yummy what can you use instead of the red wine vinegar? I’d try white wine vinegar or champagne vinegar. Enjoy!